Undoubtedly, if I could go back in time to the early days of this blog's life, I would post far more about the types of crafts that interest me, share examples of such that I'd made, and in general weave that side of myself more into my writing here. As it stands now, as much as this point genuinely pains me, due to my uber busy workload and family commitments I rarely have time to craft. I am trying to somehow carve out a little bit more space in my life for this important, relaxing, fun filled part of my life though and wonder will 2016 bring me much in the way of time to craft? Ask me at the end of next December, because before then, your guess is as good as mine. :) I truly hope that it does however, because I always feel like a poignant part of myself is missing when I don't get to craft for long spells, as has been the case for the past four years and counting now. The nature of today's post is an upbeat one though, so I won't chat on and on about such things. Instead I thought it would be a lot of fun to share a good sized selections of websites that currently offer free cross stitch patterns. Cross stitching was one of the first crafts I picked up as a child and I've been a devoted stitcher since the age of about 5 or 6. Over the years, particularly during when I was a teenager, I've made many different cross stitch pieces ranging in size from a few inches to large framed designs, the overwhelming majority of which I've created and given away (once they were finished) to a specific family member, dear friend, or other person who was/is very close to my heart. Last year I purchased a couple of wonderful new patterns, including a marvelous Halloween themed one, and hope that I'm able to start work on, and possibly even complete, at least one of them in 2016. Though I bought those two patterns, there are lots of great sources for free cross stitch patterns online, some of which I've availed of myself over the years and many more that I hope to as time goes on. The following selection of 32 free cross stitch pattern sites is by no means a 100% extensive list of every site that offers free designers (and many more can be found on sites like Pinterest, where I keep a board devoted just to cross stitch related pins), but it is a handy resource for those who share my passion for this age old, relaxing, wonderfully fun craft. Anytime you find a free pattern online, it's best to try and ensure that it is in fact being shared fairly and that no one's copyright is being in fringed upon. If the image is a photo or scan of a modern book, chances are such is not the case. Look instead for sites where designers post patterns that they've created themselves for the purpose of free distribution and, when in doubt, try to find the original source of a given cross stitch pattern. 1. 123 Stitch: A charming selection of mostly small to medium sized designs, including plenty with text. 2. All Crafts: Here you’ll find a diverse selection of patterns spanning an array of subject matter (holidays, animals, butterflies, flowers, celebrities, Halloween, Christmas, Celtic designs, and many more) and styles (multi-colour, blackwork, etc). 3. Better Cross Stitch Patterns: A small selection of sweet, homey/country romantic (does anyone else miss the days of when that craft and decor style was huge in the late 1980s and 1990s?) patterns, many of which include hearts in the design. 4. Bird Cross Stitch: This site offers up wonderfully lengthy directory of free online cross stitch patterns. Though (last I checked) a few links lead to sites that are no longer online, there are still plenty of lovely sources to be gleaned from this very helpful page. 5. Country Living: From the fine folks at Country Living Magazine, comes a delightful little selection of mostly standalone image cross stitch patterns, each of which - as one might except - has a lovely country/farm life theme to it (think red apples, watermelon slices, green wellies, etc). 6. Cross stitch patterns from About.com: Another great directory of free online cross stitch patterns (many of a classic nature), this time from the fine folks at About.com. 7. Cross Stitch Pattern Heaven: A fun array of primarily animal, bird, and butterfly related cross stitch patterns. 8. Cross Stitching: From the official site of some of the UK's most beloved cross stitch magazines (such as Cross Stitch Crazy, Cross Stitching World, and Cross Stitch Gold) comes a terrific selection of free patterns from some of today's most beloved modern cross stitch designers. 9. Cross Stitch Patterns: A good sized assortment of fun free patterns, each conveniently grouped by theme, such as cats, Fabrege Eggs, buildings, fruits, kids, flowers, mermaids and many, many more). 10. Cyber Stitchers: From this popular online cross stitching community website comes a plethora of free patterns covering everything from holidays to American patriotism, samplers to monograms and tons of other topics that fill 106 pages (and, presumably, counting!). 11. DMC USA: This world famous brand of sewing and stitchery notions delivers a lovely selection of well made, elegant free cross stitch patterns. 12. Daily Cross Stitch: One of my favourite free pattern sites, Daily Cross Stitch encourages folks to signup for their daily emails, each of which delivers one new free cute/modern style pattern to your inbox everyday, for which the link to download it for free remains live for 24 hours (older patterns can be purchased for a song online after that 24 hour window). 13. Free Cross Stitch Patterns A nice assortment of free patterns, arranged by subject matter, including multiple entries for categories such as seasonal, religious, photographic designs and many more. 14. Free Patterns Billing itself as the world's largest online source of free craft patterns (they also have free beading, crochet, knitting, paper crafting and other types of patterns), this great site houses a bevy of assorted cross stitch designs with new entries added on a regular basis. 15. Free Cross Stitch Pattern Central: With more than 17,000 free cross stitch pattern, this huge online compendium is sure to deliver many different designs your way that you'll be chomping at the bit to start stitching (I would note though that sometimes the links to certain patterns are broken, but still, there's plenty that work and more than enough patterns to keep any cross stitcher busy for ages!). 16. Free Patterns Online: From Christmas to St. Patrick's Day, florals to numbers, there's plenty of lovely designs to be had on this free pattern site from designer Carrie Luhmann Pieniozek. 17. Gloria Pat: Fans of Precious Moments and similar styles of cross stitch designs are sure to adore the free selection on offer from this South Carolina based online pattern shop. 18. Hatflix Patterns: Though some patterns on this European site are not free, amongst those that have a small sticker price, one can find a slew of others that are (and which span a vast array of subject matter, from cityscapes to pets, holidays to snowflakes). 19. Hobby Loco: A well laid out selection of free patterns, many of which center around animal, holiday (Valentine's Day, Easter, 4th of July, Halloween, Christmas, etc), and outdoor themes. 20. Janlynn: Sweet, lovely free cross stitch designs of various sizes and themes, including plenty of great nature/outdoor related patterns. 21. Just Cross Stitch: From Just Cross Stitch magazine comes a small array of stylish, timelessly pretty patterns that are updated/changed from time-to-time (so you'll want to bookmark this one and check back periodically for new designs). 22. Kreinik: Well known thread and sewing notions brand Kreinik serves up a delightful selection of free cross stitch patterns, primarily centered around angels, season, Halloween, and Christmas related charts. 23. Linen Flowers: A really lovely selection of classic, sweet, and cute patterns spanning an array of subjects, many of which have a religious nature to them. 24. Lizzie Kate: Fans of rustic, colonial, country, and primitive style cross stitch patterns will flip for the free beauties on offer here form talented designer Linda Ebright (I want to make all of them, especially the Halloween ones!). 25. Love Stitch Designs: A charming little selection of primarily modern cross stitch designs that even includes charts for such contemporary themes as the Hunger Games and (the website) Reddit. 26. Martha Stewart Free Cross Stitch Patterns: As one might expect, the little handful of terrific free charts available from Martha Stewart's site will have you running for your thread box at the speed of light. 27. Maurer Stroh: This is another site that fans of seasonal and holiday related free cross stitch patterns will definitely want to check out. The patterns are often quite detailed, timelessly pretty, and ideally suited to giving as gifts for all kinds of special occasions. 28. My Cross Stitch Patterns A multi-lingual website that serves up a fun helping of classic and modern free designs, including some featuring Disney and Simpsons characters. 29. Needle Pointers: From borders to home decor, pincushions to samplers, this great selection of free charts is bound to have something for nearly every cross stitch fan. 30. The Snowflake Diaries: Eastern European designer Maja's whimsical, gorgeous, often country primitive style charts make her one of my favourite cross stitch designers on the planet. Sift through her blog and have a blast savouring each of the fantastic free charts she has shared there since it launched in 2013 (then swing on by her Etsy shop, if you're find yourself hooked and would like to buy others that she offers up fo sale there). 31. Tiny Modernist: As its name implies, this delightful site provides visitors with a great selection of fun, pint sized contemporary free cross stitch patterns. 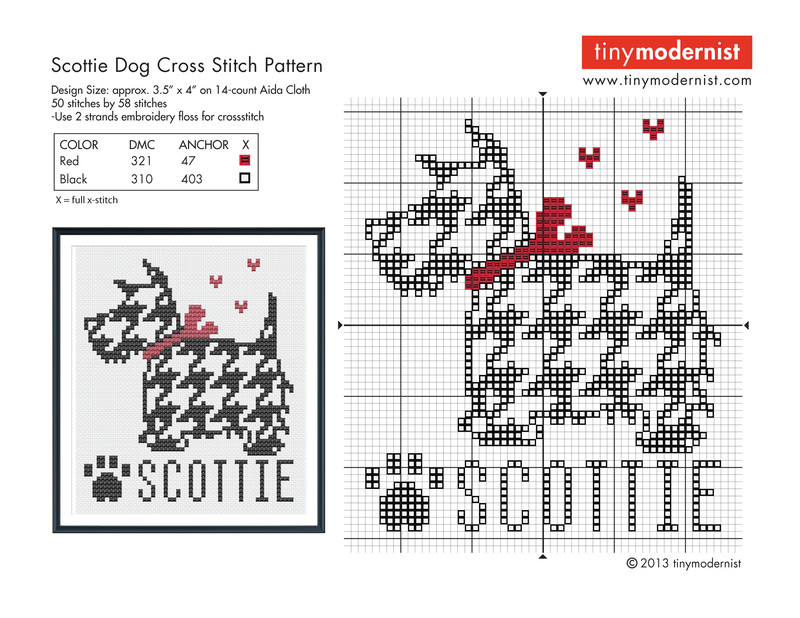 Many of them are fairly modern/classic looking, but a few have a lovely vintage-y vibe to them as well (such as this adorable Scottie dog pattern). 32. Stitch Alley: Alphabets, celebrities, holidays, animals, florals, seasonal, and more greet visitors to this bilingual (French and English) European free cross stitch pattern website, the even includes a chart staring Marilyn Monroe. The art of cross stitch dates back for many centuries and has a been a much loved form of needlework for just as long. From classic samplers to geometric modern designs, holiday pieces to images of famous folks, just about anything you can think of has probably been turned into a cross stitch pattern at this point and while not all are available for free of course, it's awesome that there are many lovely, creative patterns of various sizes and levels of complexity available at no cost online, each of which those of us with a passion for this hobby can avail of. In today's highly digital, go-go-go paced world, cross stitching is a classic craft that, by its very nature, ensures that one has to slow down and savour both the moment and the act of what they're creating. No matter how fast you can whip up those cute little x's, even a "one hour pattern" takes at least that and can be a truly welcome respite from the breakneck speed of the 21st century world we inhabit. Cross stitching, like many other crafts, is a thoroughly vintage pastime to boot and one that is quite simple to learn and quickly become very proficient in. Plus, it has the added bonus of not having to cost an arm and a leg, especially if you buy primarily as you go along/need something. It's also a great craft to start children off with, once they're old enough to responsibly handle working with a needle and thread. This isn't the first crafting related post I've shared here over the years, but as I began today's entry by saying, there hasn't been a ton of them. I hope that as time goes on, I can share more, including some featuring my own work - perhaps doing so will help spur me on to try and inch out a little more time to actually craft! Are you a fan of cross stitch as well? Are there any free cross stitch pattern sites that you enjoy that aren't listed here? Please feel free to share them in the comments below if there are. The bigger this list, the better for stitching fans everywhere. I've never tried cross stitching but I always wanted to. Perhaps this will be the year I try it! I know all too well about everyday busyness getting in the way of crafts! I hope you will be able to find some time for yourself to get back into it! Also, such great pinterest boards! I could spend hours browsing your boards! It's so fun and relaxing. I love the soothing methodical-ness of cross stitch and am certain that's part of the reason it has always appealed to me. I hope that you adore it, too, if you give cross stitching a go. Hi Jessica, so glad you're thinking of getting back to crafting and what you love. I have had to step away from it for the last few years but have managed to squeeze some time in the last few months and wow...what a feeling! I knew I missed it but I didn't realize how much. I'm hoping to get back at it on a regular basis soon. I hope you can do the same as it's so enjoyable. I find the hardest part is getting started, you just have to go make yourself do it. Once I start, I don't want to stop. Good luck and best wishes, Kelly. Thank you very much for your understanding and supportive words, Kelly. It's fantastic that you're been able to reintroduce crafting back into your life on a more regular basis as of late. That's really encouraging to hear! I would love to try cross-stitching again, this is really great! thank you for sharing! My absolute pleasure, Amanda. Sometimes I really like to switch things up here in terms of breaking from the sorts of topics I usually cover and when doing so happens to relate to crafting, I jump at the chance! Fingers crossed (stitched 😊) that we can both hop back into this craft in2016. Great list here, I didn't realise there were so many free pattern options. I do enjoy cross stitch though it tends not to be the first craft I go to, that would be knitting or sewing. However, I would like to do more cross stitch and also embroidery this year. I hope you get to make some space and time to return to crafting. Thank you sweetly, my dear friend. You've always been so supportive of my (often unsuccessful) attempts to make more time for crafting and want you to know how much I truly appreciate it. My pleasure, dear gal! It's been quite a while since I tackled a cross stitch project of any size, too, so we're in the same boat there. Hopefully we can both get in some stitching again this year. Thanks for this! I just got some thread and cross stitch fabric for Christmas--I printed out a few designs to start with but this will be very helpful as I get back into the craft! You're sincerely welcome, lovely lady. How exciting that you received some cross stitch related items for Christmas. I was really impressed, in the course of putting this post together, to see just how much the craft and what is available for it has expanded in recent years. Ultimately though no matter what comes along, to my mind, it is the humble nature and simple tools required to create a project that give cross stitich its lasting appeal. Ooohh, same here! I don't own any antique stitcheries yet, but I would very much like to one day. The humble beauty and soul of the era that they hail from always endears these elegant creations to my heart. How marvelous that you come from a long line of talented needle workers, dear Beate. You may not feel drawn to create stitcheries, but you are definitely a skilled wizard with a needle and a truly fantastic sewer, too. My pleasure, dear Kate. Indeed, cross stitch is an ideal hobby for those of almost all levels of crafting ability. Have an awesome Valentine's weekend! I used to crochet and last year treated myself to a kit but I didn't factor in the bunnies who are very much of the "What are you doing?" mindset if I try to do any and there they are having a nose! Big hugs & joyful Valentine's wishes! I love cross stitching! A dear friend gave me a chart featuring the cover of a children's book - I'm not sure if it's copyrighted since she made it with a pattern-maker online, but it's really enjoyable. I think when I'm finished, I may donate it to a library. What a thoughtful, lovely thing for you to do (and also for your friend to have done, too). I'm sure that most any library would welcome a beautiful handmade gift like that with open arms. Wishing you a splendid Valentine's Day! Thanks for sharing these cross stitching patterns. While I love to sew, I can't stand how my hand sewing looks, so I'm not sure if I'd be any good at cross stitching, but the idea sounds fun. I do hope you find time this year to craft. Wishing you the best of luck. Thank you very much, sweet dear, I really (!) hope so as well. One might think that these days san laptop would be ideal for such, but alas, I'm too busy wrapping up the DIY, redecorating and organizing projects we started around our house next month. Perhaps I'll give myself a little spring break later in the year and try to get in some crafting them (if not sooner, that is). I loved reading your post.i just recently got into cross stitching after having trying it as a kid, I decided to give it another go after contemplating it for months and I am loving it.. It's almost becoming an obsession, I am finding more and more patterns I'd like to try. My question for you is.. I, for now, am only comfortable with stamped cross stitching until I can get good at it before tackling counted. Is there a way to print any of these free patterns off to transfer onto something to cross stitch? Any advice would be greatly greatly appreciated and helpful! Thanks!